Thanks for stopping by Veggie by Season! 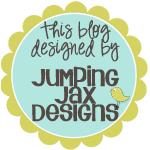 This blog was formerly A Year in the Kitchen. When I began blogging, the intention was to chronicle my first year in the kitchen as a married gal. I had so much fun that it lasted three wonderful years. My life has changed a lot in those three years though, and so has my blogging style and content. I invite you to read the About the Author page for more information about me and my blog, just click on the link above! All of the Superbowl buzz and meal ideas has caused me to have chili on my mind, as well as potato skins. Two things that can be very unhealthy, depending on how they're prepared. I decided to kind of pair the two and make chili topped potatoes, but with a healthy twist. This meal is so full of color, nutrients, vegetables, spice, and freshness. It was so hearty, and totally filled my cravings for chili and potatoes. Pierce potatoes, place directly on oven rack. Bake for 45 minutes to an hour, depending on the size. Heat a pot over medium heat, add 1 tbsp. EVOO. Add onion, garlic and bell peppers. Season with salt and pepper. Saute' for 5-7 minutes, until softened. Add tomatoes, spices, and kidney beans. Bring to a simmer, stir and cook for about 20 minutes. Plate potatoes, top with chili, avocado slices and cheese. Sounds like a perfect fushion of two already great inspirations. I love the avocado on top! These look amazing! I love avocados especially, so I might have to try this one. It looks like a fun twist! 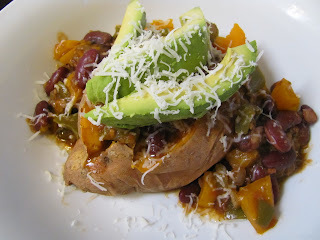 I love sweet potatoes and love chili so this looks perfect!! This is a very nice twist to chili. I always have chili at home but i have grown tired of the same old recipe. Thanks for sharing this with us as it looks like I would have chili again at home, especially topped with avocados! This looks so delicious. I'll wash it all down with espresso coffee during dinner. Great post! You've definitely set off a chili craving on this end as well. I love the idea of having it in a sweet potato bowl!